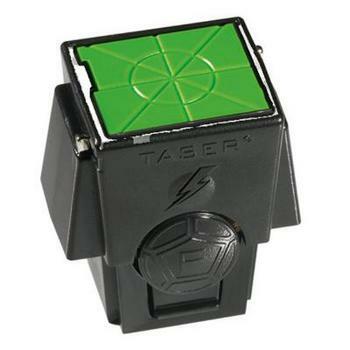 Package Contents: 1 - TASER® Law Enforcement Green Door XP Extra Penetration Live Compressed Air Cartridge with 25 Foot Range Past the Expiration Date. Live cartridges past the expiration date provide a realistic training experience and are therefore ideal for certification and recertification at TASER training class. For use with the AIR TASER, M26, M26C, M18, M18L, X26, X26C, X26E and X26P Advanced TASER® weapons. The Green XP Extra Penetration Barbed Darts on the end of the weighted probes are longer than those in the yellow or silver cartridges meant to penetrate extra thick clothing, so they are ideal for outdoor use in cold weather climates. Cartridges are self-contained with compressed gas, barbed projectiles, insulated wires and TAGS (tiny identification tags). Each cartridge fires only once.